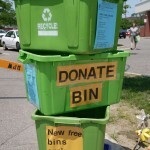 Luckily for us, Farmington/Farmington Hills residents received new, free single-stream recycle bins this past August! Residents donated over 600 old bins to the public schools to enhance their recycling efforts and help foster environmental stewardship. The district has experienced a huge increase in student/staff participation since the distribution of over 600 bins throughout elementary, upper elementary, middle and high schools! Way to go, Farmington and Farmington Hills! In 2008, Peace, Love & Planet launched a garden plastic recycling program for our community. This provided an alternative to the landfill for gardeners and landscapers plastic. During this time, we recovered over 42,000 pounds of garden plastic! We are proud to say the cities of Northville, Farmington/Farmington Hills, Livonia, Ann Arbor, Plymouth and Canton have implemented and expanded citywide curbside recycling to include garden plastic! This is terrific progress towards sustainability for our communities. 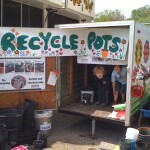 PLP will no longer be recycling in 2012 and instead will focus efforts exclusively on environmental education! As we anxiously await for spring planting season to commence, keep in mind our intentions and be mindful of the results. With any luck, our gardens will ﬂourish; but what about the heaping piles of plastic containers, trays and annual cells? To be precise, *350 million pounds of garden plastic waste is generated annually, of which only 6.8% is recycled. Very few recycling centers recycle Polypropylene (#5) and Polystyrene (#6) plastics. Peace, Love & Planet (PLP) was initiated to provide alternatives for garden plastic waste. PLP strove to encourage participation and industry responsibility in resource utilization and recycling. We provided beneﬁcial alternatives for plastic disposal to farmers, landscapers, nurseries and end consumers for 4 years. Recycling saves businesses from hefty waste removal fees, while greatly reducing precious nonrenewable resource consumption. This recycling program for the landscaping industry is met with mixed emotions–enthusiasm and circumspection. I recommend that the skeptics look at committed nurseries, such as Plymouth Nursery and Goldner Walsh Nursery (which has been recycling for over five years). Both nurseries have not only saved over $1,000 annually in waste removal fees, but have signiﬁcantly reduced their landscaping carbon footprint. I encourage you to take advantage of this opportunity to reduce your business waste removal expenses and become a true “green” partner. Contact Nathan Diller with East Jordan Plastics to arrange your pick up!